WHAT IS THE CEDULA DE HABITABILIDAD? This is a certificate of occupancy, a document the size of a postcard which provides evidence that a property has been built according to technical regulations and has also been accepted after inspection. Only with evidence of this certificate it was possible in the past and is possible now to connect one’s property to the public sewerage system, as well as the public electricity, water and gas supply network. If a property owner, based on electricity and water contracts and related invoices, could prove his connection to the public supply net, it was clear that cédula de habitabilidad had to have existed. Likewise, the official first entry of a property in the land register or its registration is linked to the presentation of this certificate. WHAT DOES THE CERTIFICATE OF OCCUPANCY LOOK LIKE? WHAT INFORMATION CAN BE FOUND ON THE CEDULA DE HABITABILIDAD? WHAT DIFFERENT TYPES OF CEDULA DE HABITABILIDAD EXIST? After an official building inspection, confirmation of habitability, first occupancy or after reconstruction of a property when only the foundation walls had survived, subdivisions, changes of use, structural enhancements / changes, etc. After expiry of the certificate of first occupation, for new applications of electricity, water and gas mains, etc..
For properties which were completed before 1st of March 1987 and have none of the above-mentioned certificates. – This document has a validity of 10 years. It should be mentioned that the majority of property owners, also in Ibiza, has seen neither the need for a renewal, nor has the original document, due to lack of knowledge, always been kept or handed over in a sale. Of course, this document is important, for example, for rentals or for larger remodeling or add-on work. However, it can always be requested by a qualified engineer or architect as a duplicate. To this end, almost the same documentation is required as for issuing a title deed. Unfortunately, by some institutions, on Ibiza as well, the lack of this certificate is currently heavily dramatized and a potential buyer might almost believe that without it he is sold an illegal property and that the property is worthless without this document. A property with evident water or electricity or gas contracts cannot be completely illegal, because the connection to the net was only possible upon presentation of the “cédula de habitabildad”. 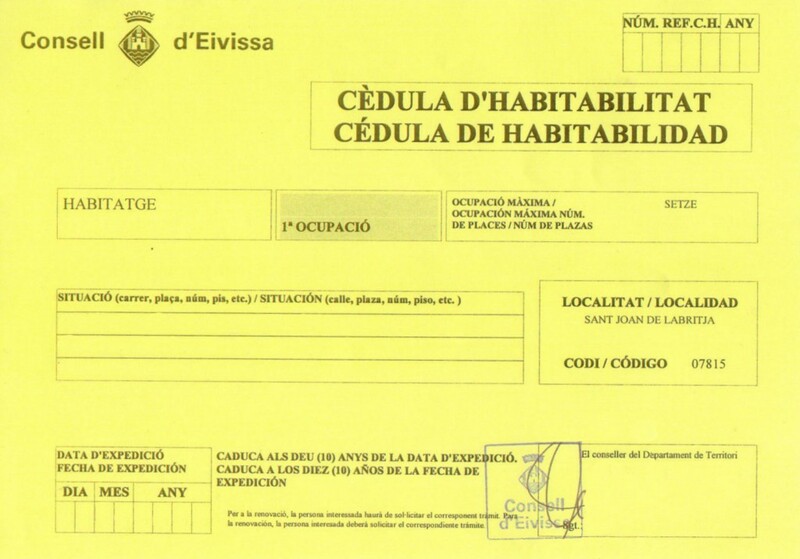 The inscription of a new construction into the Land Register and Registration office without the “cédula de habitabildad” then as now, is not possible.